You think it’s cold out there? 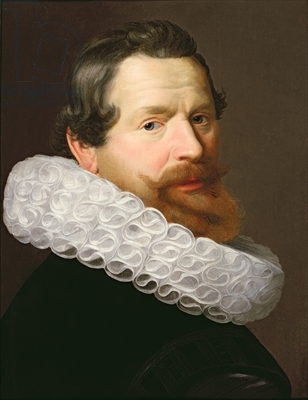 How do you think it felt in 1613 when skipper Adrian Block brought his ship the Tijger into New York Bay to trade for furs that he planned to bring back to Holland? He and two other merchant vessels, the Fortuyn and the Nachtegael, were dividing up their goods in January, getting ready to head back home across the ocean, when disaster struck. The Tijger caught fire, burning to the waterline. The other captains offered to take on Block’s crew, but Block said no.The situation worsened when some of the crew members from each ship mutinied and left on the Nachtegael. What to do? Block made a decision. He would supervise the construction of a small yacht to be named the Onrust (Restless). We don’t have an image for Block on record. Let’s imagine he looked something like this. 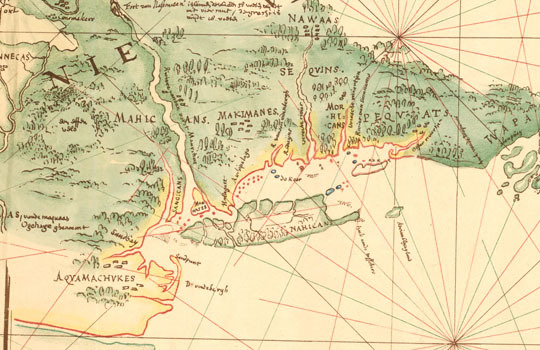 Manhattan was not yet settled by Europeans. The Fortuyn and the Onrust were too small to carry all the men back to the Netherlands. They still could not sail across the Atlantic, but Block took advantage of his down time, exploring the Long Island Sound and the New England coast (he got a land mass named after him, Block Island, off the coast Long Island). Later he drew what he found. In the spring Block and his crew were saved by the arrival of two ships that got them back safely to the Netherlands in July 1614. We know the truth of this tale not just from diary entries and oral histories but hard physical evidence. In 1916, 300 years after the rescue, the city of New York was digging at the corner of Greenwich and Dey Streets to make a new subway tunnel. Greenwich was the seventeenth-century shoreline of the Hudson. Lo and behold, workers came upon a charred keel and three ship ribs twenty feet below the ground, buried beneath river silt and landfill. To complement the find they unearthed an axe, a cannonball, trade beads, clay pipes and pottery. 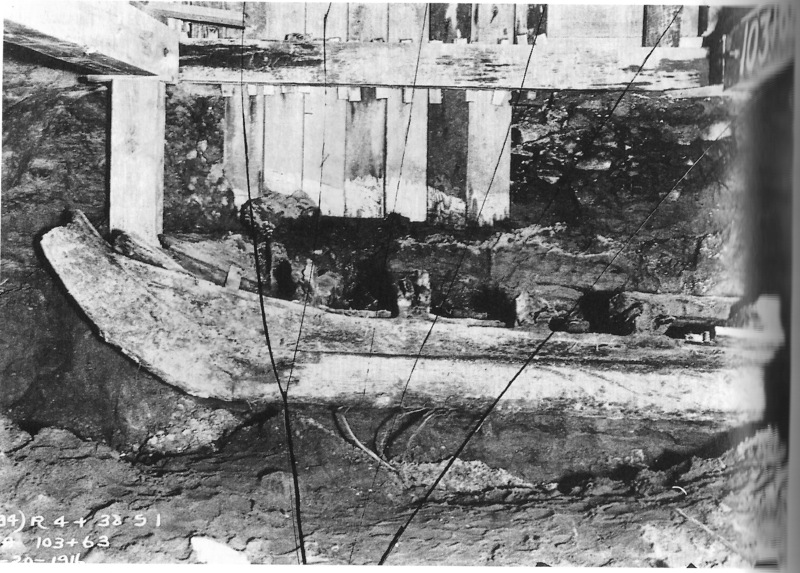 Eight and a half feet of the ship’s hull was moved to the old Aquarium at the south end of the island and submerged in the sea-lion tank to keep the wood intact. Many years later, in 1943, the remains went to the Museum of the City of New York. Later, in 1969, during more digging, a Dutch anchor and cannon surfaced near the site. That’s amazing. But not so poignant as the burnt timbers of the ship belonging to the first Europeans to experience the chill of a New York January. Four hundred years ago. if it hadn’t been helped by the indians, he would have been a BLOCK of ice! Once again, as at Plymouth, the Europeans had their asses pulled from the fire by Native Americans. I wonder if the Lenapes regretted their kindness in the years to come?